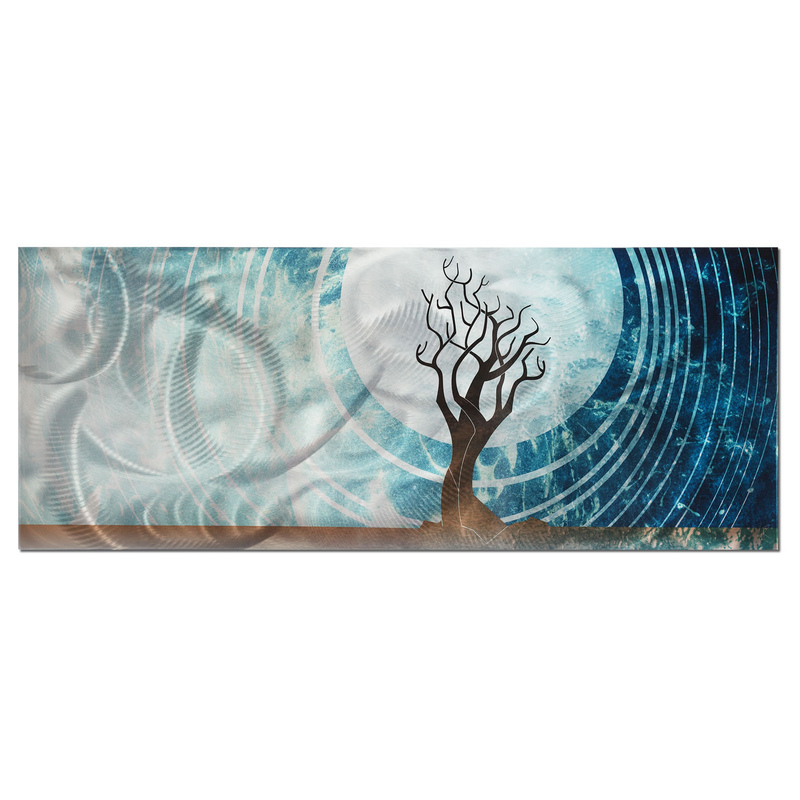 Twilight is a modern landscape piece with a clever blend of cool blues and soft browns in a bold abstract tree scene. The prominent arbor design gives this piece gentle character to balance the abstract flair of the circular moonbeams. The metal panel features a subtle random grind pattern on the surface, with crisp modern coloring in browns and shades of blue: light blue, royal blue, midnight blue, etc. The comfortable cool tones and abstract tree design are backed by an artistic full moon over the horizon, like a crisp summer night. The clever nature/landscape design creates a perfect accent against virtually any wall. The head-turning patterns make this wall painting an absolute gem of a focal point of your home, office or hospitality Decor. The semi-transparent coloring process allows the Decorative grind pattern on the metal panels to shine through while still taking advantage of the brilliant colors. Twilight will add a bit of an edgy flair, making a suburb conversation piece on your wall as the artwork accents the Decor of any contemporary, abstract or modern home or office.